The Suffolk County Legislature is slated to vote soon, possibly as early as next week, on a bill to increase the public’s awareness of chemicals used by dry cleaning establishments. BARBARAELLEN KOCH FILE PHOTO | Canada geese in the Peconic River just south of Riverhead’s West Main Street. Long Island environmental groups are planning a new campaign this spring with the slogan “It’s the water, stupid,” aimed at focusing on nitrogen, pesticides, pharmaceuticals and other harmful substances making their way into the island’s ground and surface waters. That’s according to Adrienne Esposito, executive director of Citizens Campaign for the Environment, who was among more than 65 environmental group representatives who pitched ideas to state Senator Ken LaValle earlier this month, during his annual environmental round table at Suffolk County Community College’s culinary arts center in downtown Riverhead. 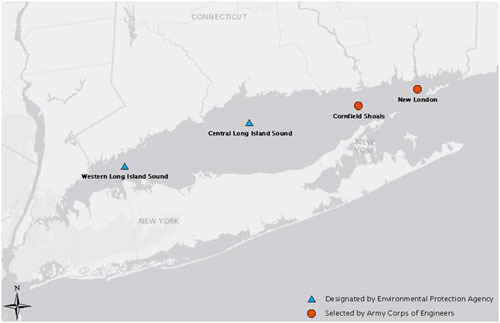 In addition to the increased frequency of algae blooms in the bays, linked to nitrogen from faulty septic systems, Ms. Esposito said 117 pesticides are found in Long Island’s drinking water. Atrazine, the No. 1 weed-killer in America and one of the most common chemicals found in groundwater, has been banned in Europe because it is an endocrine disrupter. But farmers and their advocates in attendance said some pesticides and fungicides are absolutely necessary on Long Island. Deborah Schmitt, whose family owns Phillip A. Schmitt & Son Farm Inc. in Riverhead, made a tearful plea to environmentalists to back away from supporting a ban on all pesticides. She said her family’s farm has participated in Cornell Cooperative Extension’s agricultural stewardship program, using compost and less synthetic fertilizer, but needs some chemicals to survive. She added that farmers must obtain licenses to ensure that they’re applying pesticides responsibly, while no such demand is placed on homeowners who use the same materials. Ms. Esposito said she’s not requesting a ban on all pesticides, just the top three. Long Island Farm Bureau executive director Joe Gergela said his organization wants to find common ground with environmental groups on pesticide issues. “We, too, as farmers, are concerned about pesticides,” he said, adding that 95 percent of pesticides in groundwater are “legacy” chemicals that are no longer in use. Also on the issue of groundwater pollution, Peconic baykeeper Kevin McAllister asked why the state DEC has not responded to a request he made last September that it review sewage treatment plants on Long Island that are not in compliance with their DEC permits. Jeremy Samuelson of the Concerned Citizens of Montauk also implored Mr. LaValle to help waterfront communities put in place innovative coastal zone management plans in light of the devastation from Hurricane Sandy. Mr. LaValle said the federal government is just beginning to help communities do just that, and he urged leaders in all local towns to take advantage of the opportunity to plan for the future. Mr. Samuelson also thanked Mr. LaValle for helping pass state law to protect sharks. “Given what we do, it’s a professional courtesy,” quipped Assemblyman Fred Thiele, who was also in attendance. What should happen with dredge spoil in the Long Island Sound? A dredge spoil disposal map showing current dumping sites. Don’t dump dredge spoil in eastern Long Island Sound. That was the message some speakers had for the federal Environmental Protection Agency Wednesday at a hearing on finding potential sites to replace two existing dredge disposal sites in eastern Long Island Sound. Others argued that dredging is necessary to maintain a water-based economy. There are four such dredge dumping sites in Long Island Sound now, one dubbed the Western Suffolk site, south of Stamford, Conn.; one called Central Long Island Sound, south of New Haven; one called Cornfield Shoals, north of Greenport; and one called the New London site, just west of Fishers Island. The Cornfield Shoals and New London sites are scheduled to be closed on Dec. 23, 2016, and the EPA is looking for new sites for dredge disposal, which was the subject of the hearing. Most of what is disposed in these sites comes from Connecticut, according to the EPA. That’s because the dredge material from Long Island is mostly sand, and can be used for beach restoration, whereas most of the dredge material from Connecticut is fine-grained silt or clay and cannot be used for beach restoration. The Farmingdale-based Citizens Campaign for the Environment doesn’t think any dredge spoil should be dumped in Long Island Sound, according to the non-profit group’s executive programs manager, Maureen Dolan Murphy. That group opposed the designation of the two western Long Island Sound sites in 2004 and opposes designating new sites, as well. “It did not make logical sense that after millions of dollars spent on restoring the Sound, we would designate it as a long-term dumping ground,” she said. She said CCE agrees that dredging for navigation safety is necessary, but that open water disposal for dredge materials is not. She said EPA and the U.S. Army Corps of Engineers in 2005 agreed to phase out open water dumping and to develop a “Dredged Material Management Plan” before deciding on its next step. But that plan has never been developed, Ms. Murphy said. Southold Town Councilman Al Krupski, who is running for Suffolk County Legislature in a special election being held Tuesday, echoed those sentiments. The Fishers Island Conservancy also objects to any further open water dumping sites in Long Island Sound, and feels EPA should look to areas outside of Long Island Sound and Block Island Sound for dump sites, according to Robert Evans of the FIC. He said the last large-scale dumping in the New London site was seven years ago, when about 400,000 cubic yards of dredge material was dumped there. “The lobster population was greatly harmed and few believe the damage was coincidental,” Mr. Evans said, adding that the waters near the site have very strong currents and shallow depths. “Dumping spoil in those waters is akin to throwing dirt into a fan,” Mr. Evans said. Daniel Natchez, who owns a Mamaroneck-based environmental waterfront design company, took the opposite side of the argument, saying that people need to consider the economic impacts of not dredging. “If you don’t dredge, the material that everyone is concerned about just sits there, and you swim in it, or have recreation in it,” he said, adding that people won’t have access to waterways. “These are things that are going to have an adverse effect to quality of life,” he said. And Bill Spicer, who owns Spicer’s Marina in Noack, CT, near Mystic, also feels that dredging is needed for the economy. “Connecticut has billions of dollars at stake on the waterfront,” he said. He suggested the dredge disposal sites be put in Connecticut waters, since Connecticut uses them more often. Congressman Tim Bishop and other federal and state officials announced Monday that 35 municipalities and community groups in New York and Connecticut will receive grants totaling over $1.6 million to help fund projects aimed at improving water quality within the Long Island Sound. The grants are awarded annually through the Long Island Sound Futures Fund, a public-private grant program that currently pools funds from the U.S. Environmental Protection Agency, National Fish and Wildlife Foundation, U.S. Fish and Wildlife Service, U.S. Department of Agriculture Natural Resources Conservation Service and Wells Fargo. Officials said the 35 projects will open up water passages for fish, as well as restore 390 acres of fish and wildlife habitat along the waterfront. Fifteen grants totaling about $913,200 were awarded to groups in New York. During a press conference in the Village of Old Field, officials announced that Cornell Cooperative Extension of Suffolk County, Peconic Green Growth, and the University of Connecticut were among the winners of the grant monies. Mr. Bishop described partnerships between governmental entities and community groups as “critical” due to the current economic climate. Cornell Cooperative Extension received a $128,000 grant to help fund a nearly $330,000 project called “Engaging Vineyards to Implement Water Quality Improvement.” According to the proposal, Cornell Cooperative will develop a state-of-the-art pest and nutrient management pilot program aimed at improving water quality through reducing pesticide use at six wineries. Becky Wiseman of Cornell said her group is in the process of finalizing a list of wineries that will participate in the program. “We created this comprehensive idea for the vineyard industry, because it will dovetail nicely with other sustainability projects on Long Island,” she said. In addition, Cornell Cooperative received a $95,000 grant to help pay for its “Marine Meadows Eelgrass Restoration Program.” The nearly $200,000 project includes organizing 400 volunteers to transplant eelgrass at different locations along the Sound. The Peconic Green Growth, a not-for-profit organization focused on issues that integrate environment and community, received a $60,000 grant to help fund a nearly $150,000 decentralized wastewater treatment pilot project. The group has proposed that a solution to treating wastewater without the fear of high-density development is a “cluster” approach to sewering as opposed to a running a massive centralized system. The group is in the process of finding communities interested in taking part of a decentralized pilot program through Natural Systems Utilities, a New Jersey-based company that specializes in alternative wastewater systems. The University of Connecticut received a $40,000 grant to help fund a more than $70,000 project to develop a management plan to remove invasive plants from seven acres at Great Gull Island, which is part of Southold Town, in order increase nesting habitat. EPA officials said there is a review process associated with each project in order to monitor progress and success rates. Those reviews are expected to take place within the year.